I am sanchit and today I am going to show you how you can translate some projects using transifex (https://www.transifex.com/). Please follow the following steps! 3. Now you have to select a project which interests you and join the team to get the access to the files that you want to translate suppose from 'language A' to 'language B'. 4. After going to the project page you have to click the 'JOIN TEAM' button. 5. As you can see you can select a language you want to translate to or request for a language. "our join request for the English (United Kingdom) (en_GB) language has been submitted. You will receive a notification upon acceptance or denial." 7. After your request to join the team is accepted, you can head over to your dashboard and start translating. 8. 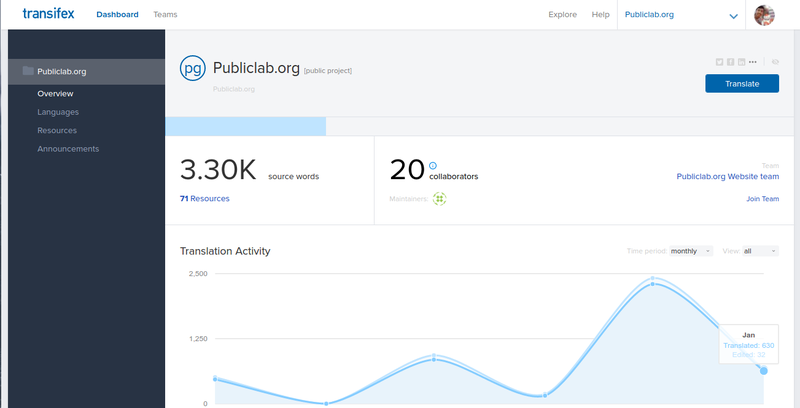 In my case the project/organisation is publiclab, I will show you a demo here how to translate the project files. 9. Click the button "Translate" which you can see on the top right-hand corner. You will get a drop-down menu to choose the languages, I will select Hindi as I had requested for it. 10. As you can see after selecting the languages you can see the list of files available for translation. 11. Click any one of them. After selecting the file you will get some words which are needed to be translated. 12. Now just click the words you want to translate and add the translated word in the right-hand text box. 13. After you have added the translated string you have to click the save button to save it. and you can move to the next word/string you want to translate. repeat the same process as you go ahead translating more strings. So, this is how we can translate the files. It's quite easy and you can translate to any language you want. Hi, I'm the sysadmin at this site, please, could you stop uploading large gif animations? They are choking the resizing process. Please contact us for uploading manually until we have a better solution. Thanks! @icarito i have stopped uploading the gifs as directed instead added the links from giphy to it. i was doing the same at first but instead of the gifs being loaded the area for the gif was blank that's why i tried uploading them manually. Now the links from giphy are getting loaded perfectly! @sanchittecnogeek thanks for your work and response and sorry for any inconvenience!